Very few other technologies are ready to disrupt our future lives more than artificial intelligence. Machines are getting better and better at learning and processing information similar to human beings. As a consequence, they take over even more jobs traditionally performed by human beings. In real life, we can look forward to automated transportation (self-driving cars are already on our streets), robotic limbs and machine-powered care for the elderly. Technology will become part of everyday life even more and we will interact with it on an increasingly regular basis. Naturally, that includes the digital space and, by proxy, WordPress. We have already talked about WordPress plugins that use artificial intelligence in an earlier article. In this post, we want to take the topic a few steps further and make some predictions about how the rise of AI will influence the WordPress platform and the web in general in the future. For that, we will particularly concentrate on the areas of web design and development, e-commerce as well as writing/content creation. Ready to take a peak at the future of WordPress? Then just keep reading. Let’s start with the area of web design and development. Here, artificial intelligence will take over parts of both the creation of web presences and their active interaction with users. You might be surprised to hear it, but there are already companies working on AI algorithms that can build websites. 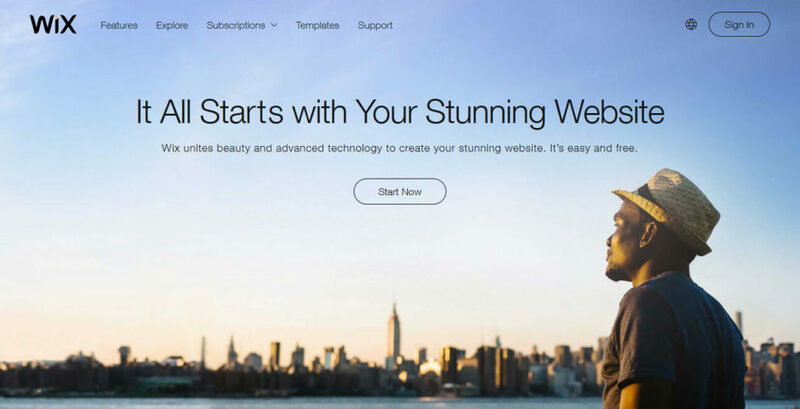 The most prominent examples are Wix ADI, Grid, and Firedrop. In each case, they offer users an AI assistant that helps determine the type of website you are aiming to create. From there, the assistant in question either makes autonomous decisions on branding, layout, design and content all by itself or, in the case of Firedrop, takes the role of a real-life web designer and leads you through the process with suggestions. Wix’s solution even scours Internet for information on the type of website to deliver the best possible solution. In the end, all you need to do is fill the site with content and you are done. So, why aren’t all designers out of a job yet? Because currently the capabilities of these platforms are still pretty limited and spit out cookie cutter websites. Especially Grid has been met with very mixed reviews since its launch. For more information, check this article. However, is it conceivable that in the future you will simply tell an AI assistant what kind of WordPress site you want and have it do the rest? Why not? While we are still far away from it, the first steps in this direction have already been taken. Plus, you can even outsource parts of your web design to artificial intelligence through services like Logojoy and Bannersnack. Similar things are in the works for print design, meaning AI could upend graphic design in general. However, the applications of AI don’t stop at website creation. On existing sites, machine learning could help dynamically adapt the design and content to user needs. Thanks to user analysis and the ability to process vast amounts of information, AI can help predict visitor intent and create the best possible experience. Imagine a site that, if your online activity suggests that you are allergic to lactose or gluten, automatically serves up recipes and images accordingly and automatically. We are already seeing personalized ads and search results on today’s web, so why shouldn’t other parts of the web experience follow suit? The Death of the Entry-Level Job? However, while machines are great at sifting through loads of data and performing automatic tasks, it is noteworthy that there are limits to what they can do. Specifically, AI is bad at making creative decisions and determining subjective factors like taste and emotional impact. While that is great news for creative directors making these kinds of calls, the future doesn’t look as rosy for entry-level workers. As AI gets better at understanding more complex jobs, in the future it will likely take over much of the low-level repetitive jobs currently done by humans. E-commerce is one of the sectors set to invest a lot into in artificial intelligence. In fact, according to Business Insider 72% of all retailers plan to make investments into cognitive computing/machine learning by 2021. Here’s what that money will be going toward. Just like web design in general, machine learning and artificial intelligence will be able to understand customers better and provide a more personalized experience. For example, new advances in image recognition allow virtual shopping assistants to recommend not only similar but also matching and complementary products. This includes the ability to determine size, color, shape, fabric or brand. Ever dreamed of a robot saying something would “totally look cute on you”? Now you can. Plus, it saves customers a lot of browsing around looking by yourself. Retailers that have already implemented personalization see two to three times higher sales increases than those who haven’t. It’s only a matter of time before someone builds a plugin like this for WooCommerce. Of course, the biggest step toward personalized shopping experiences will be the possibility to interact with virtual customer service agents. For example, Taco Bell is working on a chatbot that enables customers to order takeout food through a Slack channel. Chatbots exist for many different channels, including social platforms as well as WordPress. They can learn from interactions and add answers to their libraries automatically. When they get more complex, vendors will be able to move the personal in-store experience online. In fact, a recent study suggests that as early as 2020 85 percent of customer interactions will be taken care of by machines. For clients, that is useful since bots don’t sleep and can handle an infinite number of inquiries at the same time. Retailers save by having to pay fewer flesh-and-blood customer service employees. In addition to answering questions, AI bots can follow up on leads, identify prospects, be part of CRM tools, improve sales processes and much more. So beware, one of the next chats you have with a friendly employee of your favorite company might be with a robot. Taking AI-powered online customer service a step further is the possibility to use your own voice. In recent time, we have seen more and more voice-powered AI assistants like Alexa, Google Assistant, and Siri. Especially Amazon’s Alexa by now integrates with many third-party offers. Users you are able to have the assistant buy concert tickets, call an Uber and order food or flowers. There’s no reason why this type of technology shouldn’t also come to online stores. In the future, you will be able to talk to your favorite shopping websites the same way you do to your phone or home appliance. Plus, as language processing evolves, the possibilities will only get bigger. We now get to a topic that is close to my heart for obvious reasons. AI is also making its way into writing and content marketing through multiple applications. So, will a robot replace me in the future? Let’s find out. As any professional writer will tell you, one of the largest parts of creating content is doing the research. Reading and compiling information and bringing it into an order is time intensive. Thankfully, in the future, artificial intelligence might be able to do some of the heavy lifting. For example, Salesforce already uses an algorithm that can summarize the content of longer texts. It currently improves through a mixture of machine learning and help from human trainers. However, the technology is getting there. Of course, this can extend not only to articles but emails and other written communication. That way, you will be able to skim your messages before deciding which ones are worth looking into. Spell check has been around for a long time. By now, everyone should be familiar with the squiggly lines underneath incorrectly spelled words. However, machine learning can actually do a lot more than that. AI is getting increasingly better at understanding the context and intent behind written words. Therefore, it can now also correct style and grammar mistakes as well as make suggestions on how to improve your text further. This stuff matters. Last year, Yoast SEO, one of the most popular SEO solutions for WordPress, added a readability panel. 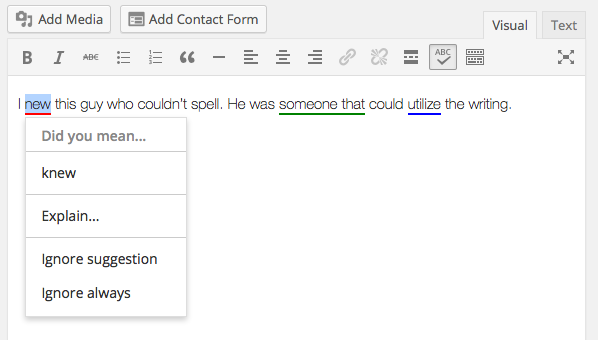 Here, the plugin checks for passive voice, overly long sentences and other writing flaws in your content that reduce the digestibility of it. AI could take this one step further. For example, it could offer active-voice equivalents for existing sentences and do a lot more of the work usually done by human proofreaders and editors. Grammarly and Atomic Reach are already players in this field. In WordPress, we have After the Deadline, which is included in the Jetpack plugin. When thinking about AI and content creation, you need to keep in mind that algorithms have already improved writing online. Thanks to Google’s updates in recent years, online content has switched from one dominated by keyword stuffing to writing aimed at human readers (with SEO sprinkled in). However, is the next step that robots will themselves create the content? Predictions say that by 2018 20% of business content will be composed by robots. In addition to that, already today, you can find offers online for AI-driven writing and rewriting services. So, is it conceivable that machines will start composing ebooks or works of fiction anytime soon? Well, it’s still a while to go until we get to this point, however, more data-heavy and less creative writing tasks are already within the realm of possibility. Artificial intelligence and machine learning are slowly but surely making their way into our lives. From talking household appliances to software taking over more and more complex work tasks, the predicted changes in real life will be drastic. Of course, this will also affect the digital space, maybe even more so. Above, we have seen that artificial intelligence will transform major parts of the Internet. From doing rudimentary web design tasks and helping to personalize websites, they might someday build entire web presences. Ecommerce will also see increased personalization as well as automated customer service that you can talk to like a person. Not even writing, an exclusively human realm for thousands of years, is safe. Machines are learning to research, proofread and even create content. Rest assured, these changes will also have an impact on WordPress. Is all of this good news or bad news? That remains to be seen. The fact is, it’s not science fiction but already happening now. We will see its effects in our lifetime. How do you feel about the emergence of AI? What other changes could you imagine? Let us know in the comments section below!